A submarine is a ship designed to operate underwater. This article uses material from the "Submarine" article on the Dr Who wiki at Wikia and is licensed under the Creative Commons Attribution-Share Alike License. A submarine was a type of watercraft which could operate underwater. Submarines were used by miltary organisations on Earth from the 20th century. Submarine article at Memory Alpha, the wiki for canon Star Trek. 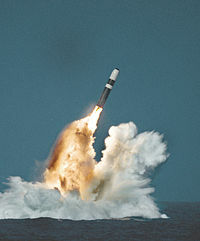 Submarine article at Wikipedia, the free encyclopedia. This article uses material from the "Submarine" article on the Memory-beta wiki at Wikia and is licensed under the Creative Commons Attribution-Share Alike License. This article uses material from the "Submarine" article on the Fallout wiki at Wikia and is licensed under the Creative Commons Attribution-Share Alike License. Submarines are a recurring form of transportation in Final Fantasy. They allow the party to explore the sunken areas below the ocean. A small wooden barrel is used by the Warriors of Light to travel from the town of Onrac to the Sunken Shrine and back. Unlike submarines, this one is not controllable on the World Map. The Airship Nautilus doubles as a submarine. The Submarine is built by Xezat Matias Surgate to allow him and the party to sneak into the Barrier Tower around Castle Exdeath. This stand alone submarine can only be used in the Second World. The party uses it to enter Ghido's Cave which had been sunk by Exdeath. The Submarine appears to be yellow, perhaps as a reference to the Beatles' hit song "Yellow Submarine". Later, in the Third World, the Airship is rebuilt by Cid Previa and Mid Previa to double as a submarine. Here, it is the only way to reach several locations, such as the optional dungeon, Sealed Temple. Submarines are vehicles used by the Shinra and are based in the Junon Underwater Reactor. The party steals one while hunting for the Huge Materia in the Reactor. There they can choose to fight a few Shinra Guards that Cloud Strife once worked with while incognito in Junon during President Rufus Shinra's inauguration, or spare their lives. There is a short mini-game in which another red sub is fought. If the enemy submarine is not defeated, the Huge Materia is lost forever. Afterwards, the player can find the red submarine inside the submarine dock at the Underwater Reactor. If it is defeated, examining the sunken submarine on the sea floor will find the Huge Materia. This mini-game can be played in Gold Saucer. The Kanji on the normal party submarine means "#2", which the enemy red submarine means "#1". Cid builds his submarine, Jane to allow the Comodeen to find the Flying Water required to get his Airship, Sylvia flying. However, Pist Shaz XI of Gaudium captured Jane and her occupants in the Ocean Puzzle, their adventures within taking up much of the latter half of the series. This article uses material from the "Submarine" article on the Final Fantasy wiki at Wikia and is licensed under the Creative Commons Attribution-Share Alike License. The Galaga was originally part of the DHARMA Initiative infrastructure on the Island. There were docking facilities around the Island, including those near the Barracks, the Processing Center, at Hydra Island, and at the Looking Glass station underwater. It was used to travel between destinations on the Island and from the Island to the outside world. An underwater beacon helped the submarine locate the Island. During the 1970s, the Galaga was commanded by Captain Bird. A snorkel  is visible in the pictures of the surfaced submarine, which suggests that she is powered by conventional rather than nuclear propulsion. On the April 16, 2007 Official Lost podcast, writers Damon Lindelof and Carlton Cuse confirmed the name. When Locke was walking away from the submarine in "The Man from Tallahassee", he appeared to be soaking wet, despite the fact that we never saw him get into the water. This was just before the blow-up. Are we supposed to be wondering why John Locke was all wet? Damon Lindelof says: No comment. The Season 3 interior shots of the submarine were filmed on the USS Bowfin (SS-287) which is located near the Arizona Memorial. The Bowfin is a Balao-class submarine constructed in 1942. The interior is very similar to US Gato-class submarines from the same period. The exteriors of the submarine were two props located at the fish pond at Molii Gardens, owned by the Kualoa Ranch in Hawaii. A ☵ trigram is seen on the submarine's conning tower and on the shirt of one of its crew members. The same symbol appears on the bottom of the DHARMA logos. This symbol has two symbolic representations: as Nature, Water; and as one of its meanings, the Abyss. What may be a submarine mistaken for a whale is described on Day 13 of the diary transcript: "I think I saw a whale this morning... So there I was floating in the ocean when I heard a sound like a steam vent blowing behind me. I turned around and saw this really huge shape going back and forth under the surface." While Damon Lindelof and Carlton Cuse pronounced the name of the submarine as "GAL-uh-gah", (Official Lost Podcast/April 16, 2007) which is the typical pronunciation of the arcade game, the submarine's captain pronounced the name of his vessel as "guh-LAH-guh", ("The Incident, Parts 1 & 2") which is closer to how the word would be pronounced if it were Spanish in origin. Was the submarine really the only way to get to the outside world? What was the relationship between the Looking Glass station and the submarine? How was Richard Alpert able to get off the Island in order to twice visit a young John Locke prior to "the purge" of 1992 when the Hostiles took control of the barracks and the Galaga? Why was Locke wet when he came back from the submarine? Why do people need to be tranquilized on the submarine ride? Why does it appear that Richard and Ethan do not need to be tranquilized on the trip with Juliet in Episode 16 of Season 3 "One of Us"? This article uses material from the "Galaga" article on the Lostpedia wiki at Wikia and is licensed under the Creative Commons Attribution-Share Alike License. This article is for submarines in general. For the submarine involved in the quest Hunt for Red Raktuber, see Red Raktuber. Submarines are a hidden update that occurred on 27 May 2009 in which periscopes started appearing around some parts of the RuneScape coastline as part of the pre-release of the next quest in the penguin series, Hunt for Red Raktuber. The quest was not released until 2 June 2009, 6 days after the release of the submarines. At times the periscope is submerged, so players may have to wait before it appears above the surface of the water. The submerged submarine can be seen in Standard Detail, as it is shown as a dark shadow. The periscopes cannot be examined. Currently, the only known submarine is the Red Raktuber, the key focus of the quest Hunt for Red Raktuber. During the run-up to the release of the quest, there were several hints and theories concerning the involvement of penguins and the mention of the Red Raktuber. In a player-submitted poll there was a question asking "What do you think that the penguins have been up to since the Cold War quest?". One of the top-voted answers was "Building a yellow submarine." Whilst this was not a guaranteed poll, it may have had some influence on the resulting storyline. In a conversation between a player and a KGP Agent when using the random function of the NPC Contact spell, the Agent mistakes the player's disembodied voice for evidence of an intruder and says to "Batten down the hatches!" and to "DIVE!". It appears that he is commanding the crew of a submarine. The phrase "A white bird" could mean a penguin, and "Well, maybe not 'flies'" may also refer to the flightless nature of penguins. Do we ever plan to move? That’s down to Staff Sergeant ############. He’ll only reassign us if we go mad, and nobody mad would want to be reassigned. We call it Catch Twenty-Tuna. As for not being able to fly, well... we may not be able to go ‘up’, but think of all the other directions that a penguin can approach an enemy: left, right, down, inside, outside, clockwise, on our bellies, dressed as a sheep, dressed as a penguin dressed as a sheep, in a giant underwater ########################## and upside your head. And those are just options I came up with while writing this letter. This letter was partially censored, the ###'s are representitive of the censor blocks throughout the letter. The "giant underwater ##########################" could possibly be in reference to a submarine. The phrase The Red Raktuber is very similar to the Red October (October and Raktuber both being months of a calendar), the name of a submarine which is the focus of the novel and film The Hunt for Red October. The Wise Old Man was thought to have been involved, as he has a model of a yellow submarine in his house in Draynor Village. The artist's impression of Zanik seeing the "Sea monster". In Postbag from the Hedge 40, Zanik talks about her adventures from her visiting Entrana, then coming back from there and going around Mudskipper Point in which she sees a "Sea monster" in the water. This was probably the submarine periscope, although a pirate thought it was a "Leviathan" and the artist's impression included in the letter resembles a Loch Ness Monster. Immediately after Zanik's letter, Postie Pete also makes a comment about the sea monster. Note the ellipsis (...) before the text "creature", Postie Pete is unsure if it is a creature or not. Submarine, as seen on Standard Detail. The submarine landed on the beach in Yanille, during the quest Hunt for Red Raktuber. A yellow submarine is a reference to the Beatles song "Yellow Submarine". It is worth noting that on its original page, the image of Zanik and the periscope contains a hidden name/message: "zanik and pe...". For Internet Explorer and Google Chrome users, this can easily be found by hovering over the image for the "alternative text" to pop up. Mozilla Firefox users can right-click the image, select Properties, and see that the "alternative text" is "zanik and pe...". This may very well be short for "zanik and penguin submarine" or "zanik and periscope". This article uses material from the "Submarine" article on the Runescape wiki at Wikia and is licensed under the Creative Commons Attribution-Share Alike License. Trade Federation submarines were a dedicated submarine used by the Trade Federation during the Clone Wars. The Crab submarine was another vehicle used by the Trade Federation's aquatic navy. The Whaladon-hunting submarine was a craft operated by Captain Dunwell on the planet Dac. Imperial submarines were used by the Galactic Empire. This article uses material from the "Submarine" article on the Starwars wiki at Wikia and is licensed under the Creative Commons Attribution-Share Alike License.